Hello, Friends! 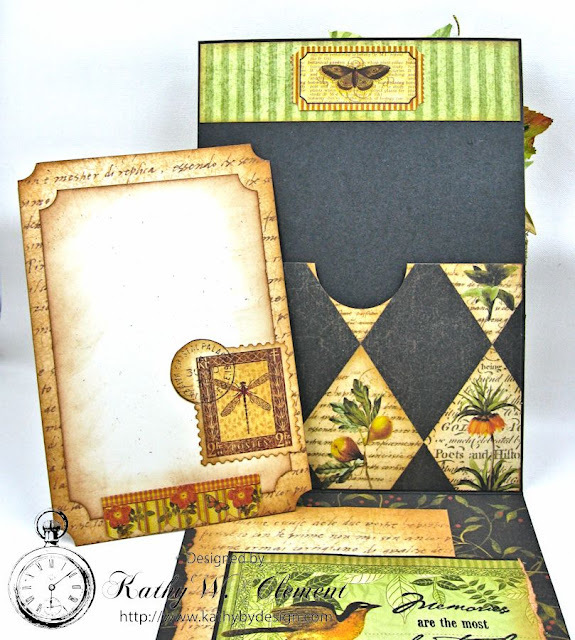 It's Kathy here, and I'm so happy to be sharing another project with you as a guest designer. While I don't have a tutorial, I do have some great tips for working with chipboard titles and laser cut doilies. 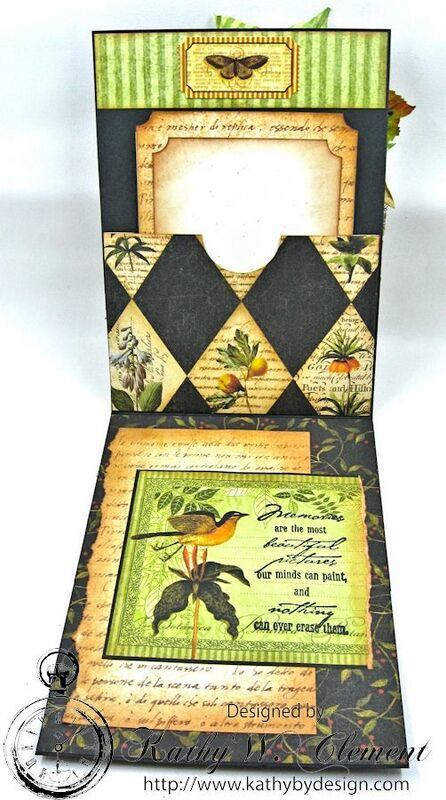 This 5" x 7" sympathy card is made with Graphic 45's Botanicabella Deluxe Collector's Edition. I kept fussing with all the layers, but the card just wasn't coming together for me. I liked all the elements, but the composition just wasn't working. Then I remembered that I had a package of Words & Phrases I in my chippie stash. Adding this elegant chipboard title was the key to making this composition work. 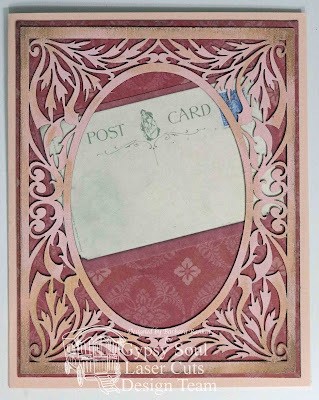 I painted the chipboard with Black Soot Distress ink, and sprinkled it with Stampendous Aged Black Embossing Enamel while the paint was still wet. In no time flat the chipboard was transformed into a thing of beauty. 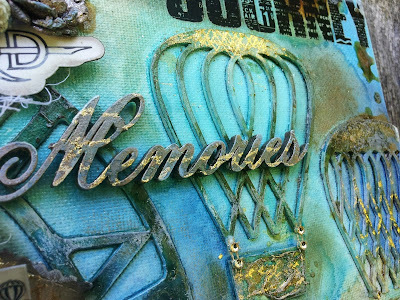 I think it looks like metal, and I love the dimension that embossing with enamel lends to chipboard. I backed the title with paper from the collection, then trimmed away the excess. Magic! 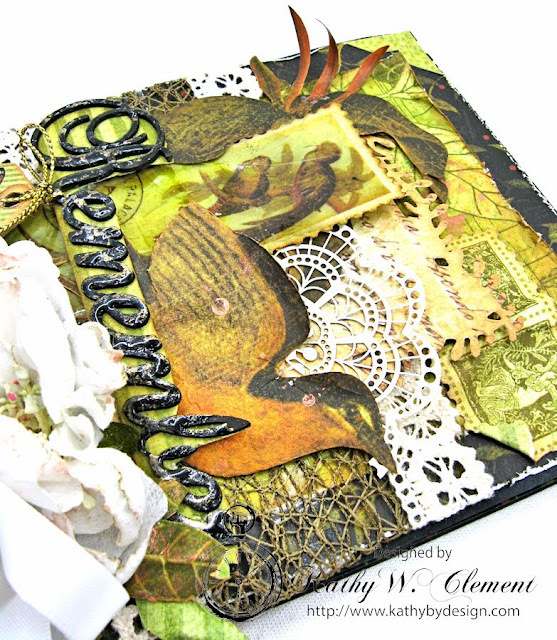 I also cut a gorgeous GSL laser cut doily in half and tucked it behind my fussy cut bird. This helped the image stand out from the background. These are not currently in the shop, but Gina assures me that more are on the way, so keep your eyes open for them! 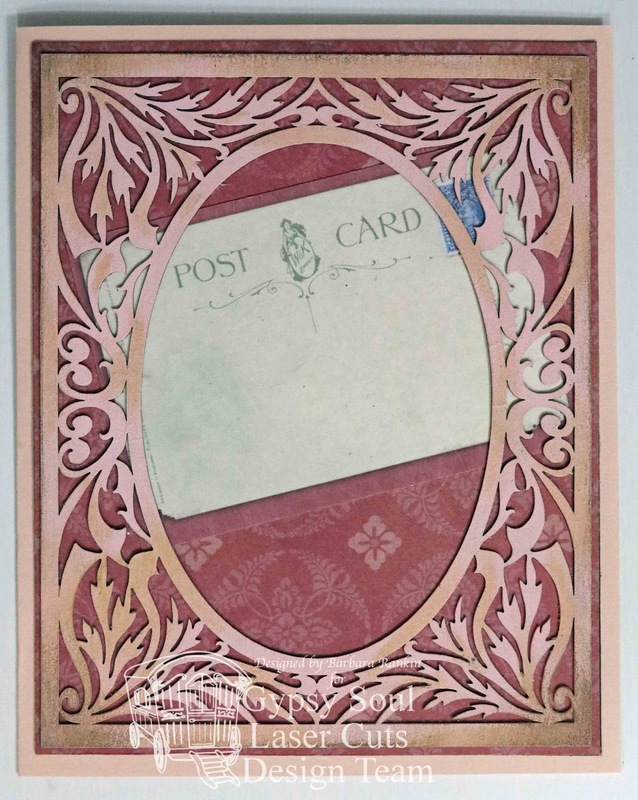 The interior of the card has a pocket with a hand made notecard. 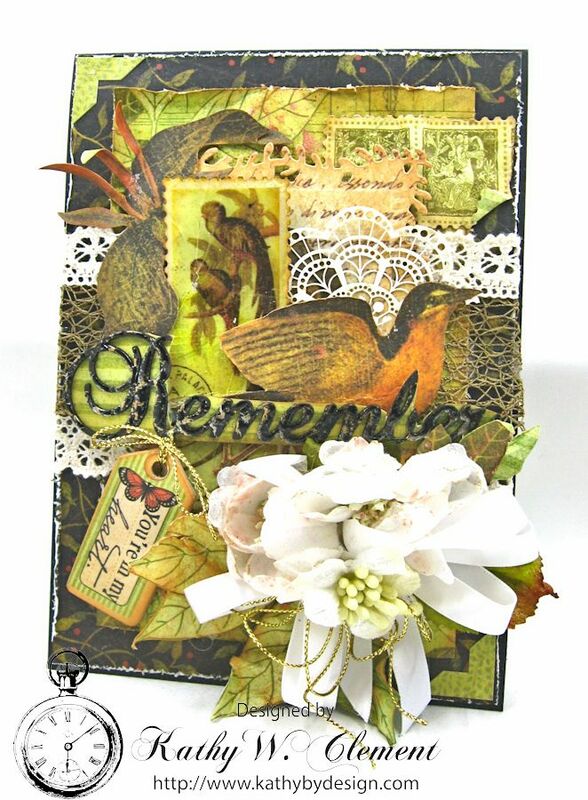 I'm making this card for my cousin, and I wanted to tuck in some old family photos of her mom in with the card. The pocket will keep them safe. 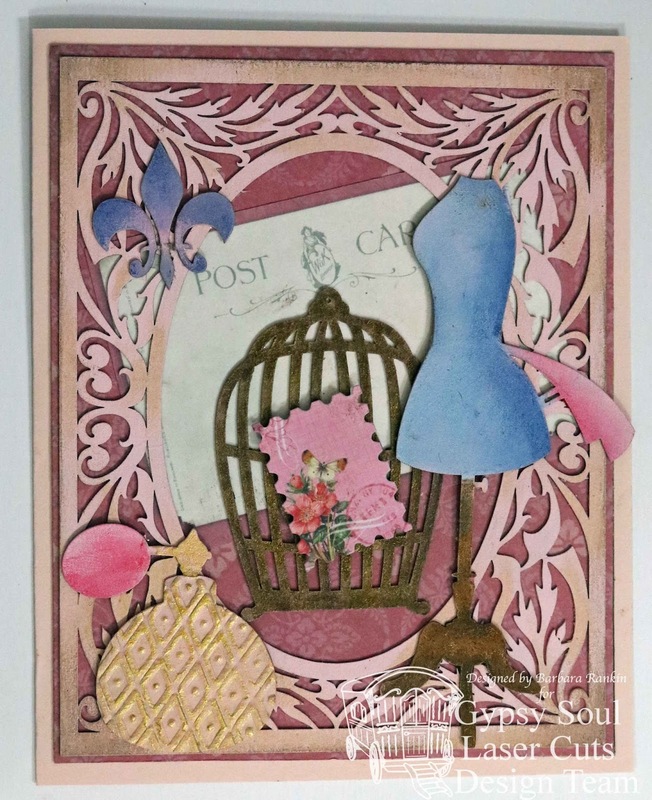 The lower half of the card has more paper layers and a hand stamped sentiment. It never fails to amaze me how a little bit of chipboard can take a project from so-so to superb! I hope I've shared some new ideas with you here today. Thanks so much for letting me join you as guest designer. Hello to all you crafters! 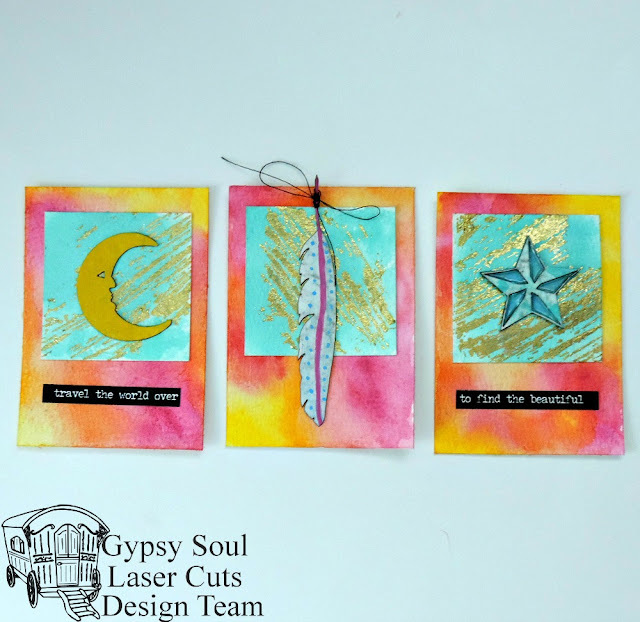 Shanna here with some ATC's that are bright and colorful and full of Gypsy Soul. The first ATC I used the moon with the face. The second I used a feather. 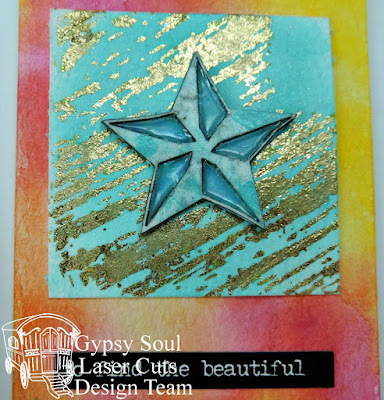 The third I used one of the stars. 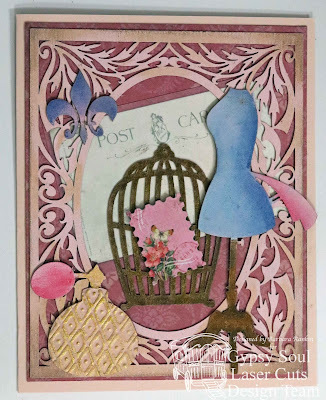 I started with watercolor paper and used watercolors to create the backgrounds. Then I used some foil on another square patch and used watercolors on those as well. 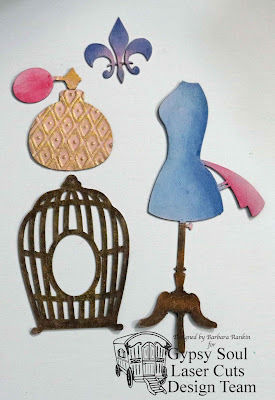 I really had a blast creating these fun little pieces and hope you enjoy some bright Summer creativity. 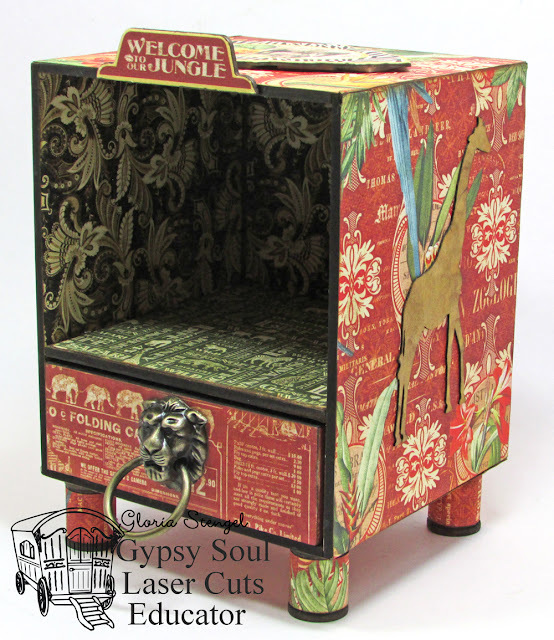 Hey guys, Jess here with the final installment of the prison cell made from the Arched Room Box that you can find on Gypsy Soul Laser Cuts under the category "miniatures"
What I ended up doing was cutting off the tabs for the front arched piece, as you'll see below and I have it set up so that it actually fits snuggly inside, along with the foam walls I added. I did this so that I can either have the box set up *with*the arches, to give it more of a prison feeling, or I can have it set up without so that you can see all the little bits easier. Here's the full view without the arched front. The prisoner has a pet mouse - because wouldn't you make friends with the mice if you were in prison. The mouse needs a name - anyone have any suggestions? Some books and scrolls stacked under his cot. Our prisoner has tried to break-out through the sewers. A reminder of past prisoners. The guards don't like to clean up. Did you spot the key before this picture? Good catch! There's a reason the prison cell is empty! His dinner cup and a scroll from his....lawyer? Full view of the bed. He's been in prison for 15 - days, weeks, months...or years? Oberon Fields is actually the name of the main character of a book series I'm writing. Labels: arched room box, Jessica A.
Hi everyone! 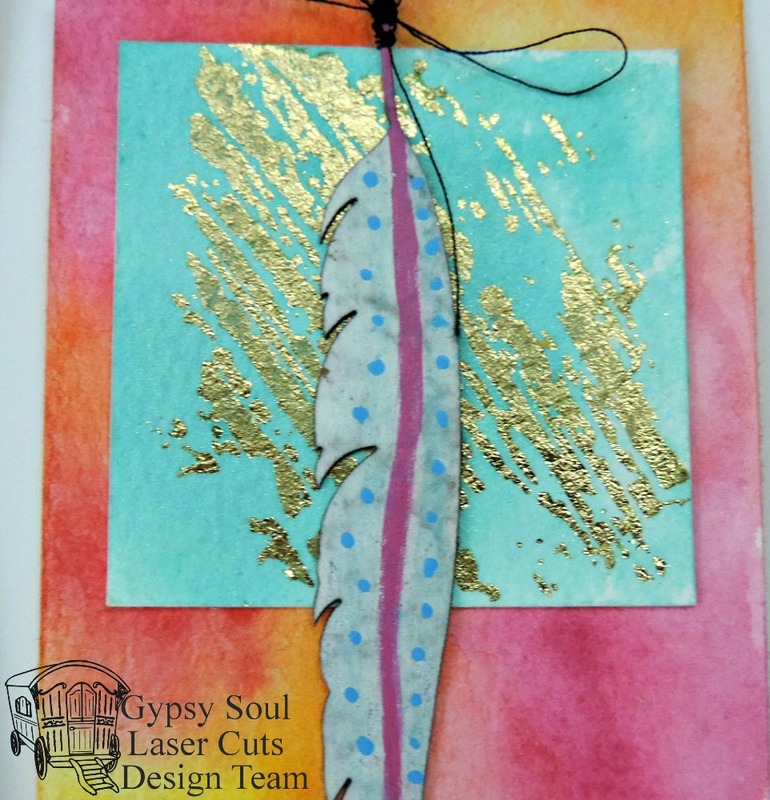 Barbara here on the Gypsy Soul Laser Cuts blog. I want to share a card today with a very feminine, and a bit shabby feel. I have birthdays coming up in the next few months, so cards to send are on my mind. 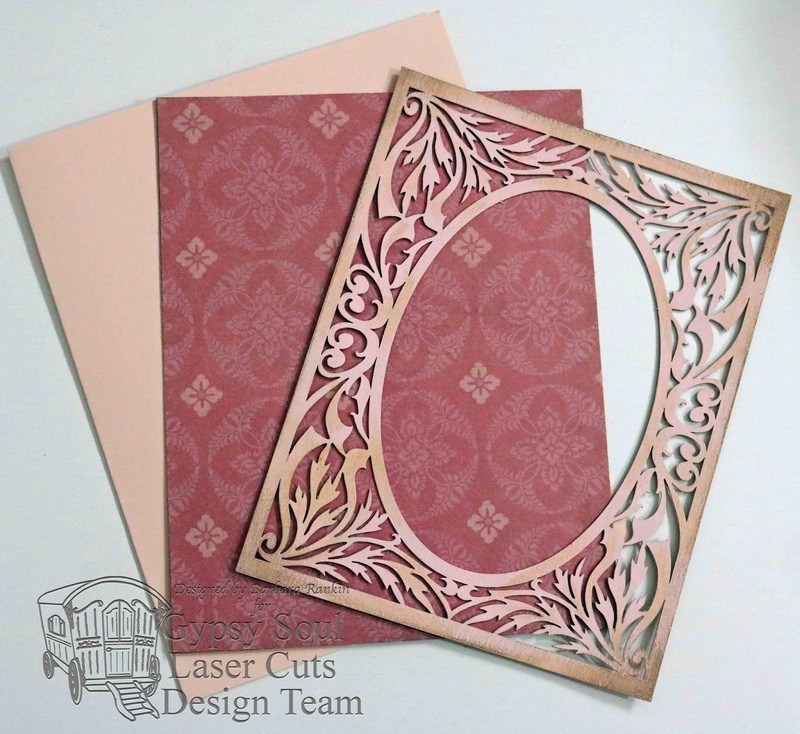 Laser cut chipboard is a real pleasure to work with, and I love how they add so much dimension to a card without adding too much bulk. 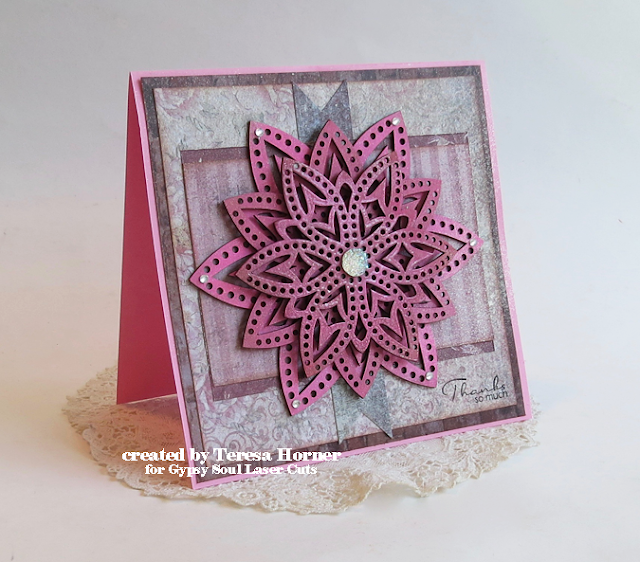 I used a pink card base and print paper layer cut slightly smaller. 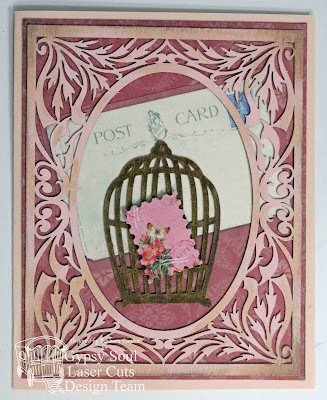 I painted the Flourished Frame Connie with pink acrylic paint and distressed it with gelatos. 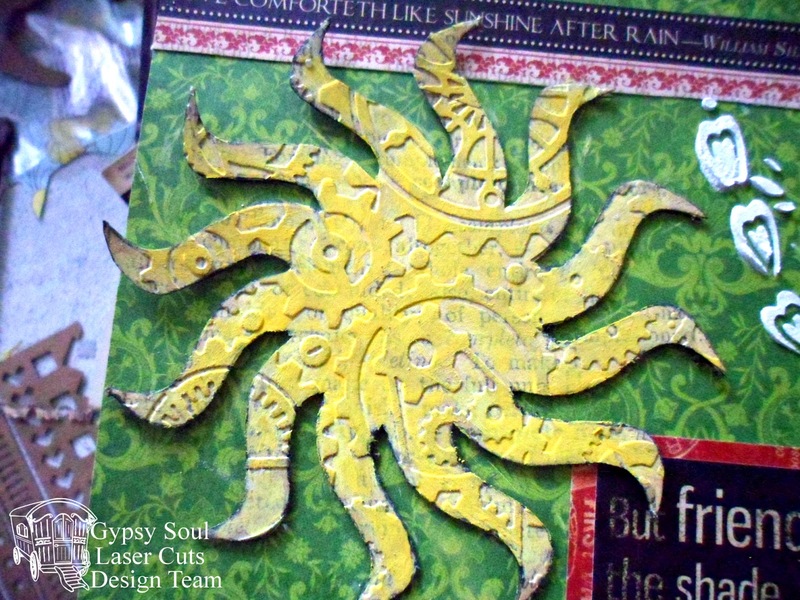 Next step, adhere the layers, as shown, including the print post card from the paper. I painted all pieces with a coat of acrylic paint before adding color with gelatos to give added depth and dimension to the pieces. 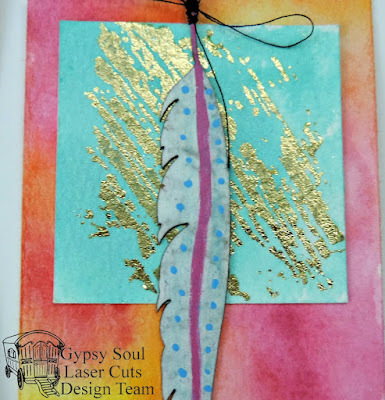 The perfume bottle was run through an embossing folder (just the bottle portion) and then I hit the high spots with a gold ink pad. 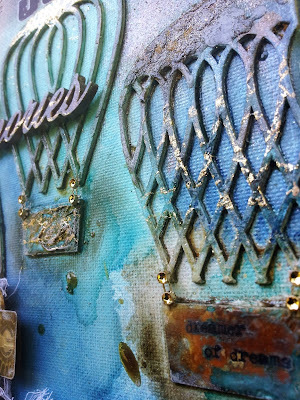 I also added some gold to parts of the bird cage, as well. Next step, adhere the bird cage with the postage stamp image over the opening. Adhere the remaining pieces to the card front as shown. Lastly, I added a few gem stickers to the fleur de lys, dressform, and perfume bottle top. I hope you have been inspired, at least a little bit, to give laser cut chipboard a go on your next card project. You won't be disappointed, and your recipient will be so impressed. Thanks for stopping by, and have a wonderful, crafty day! 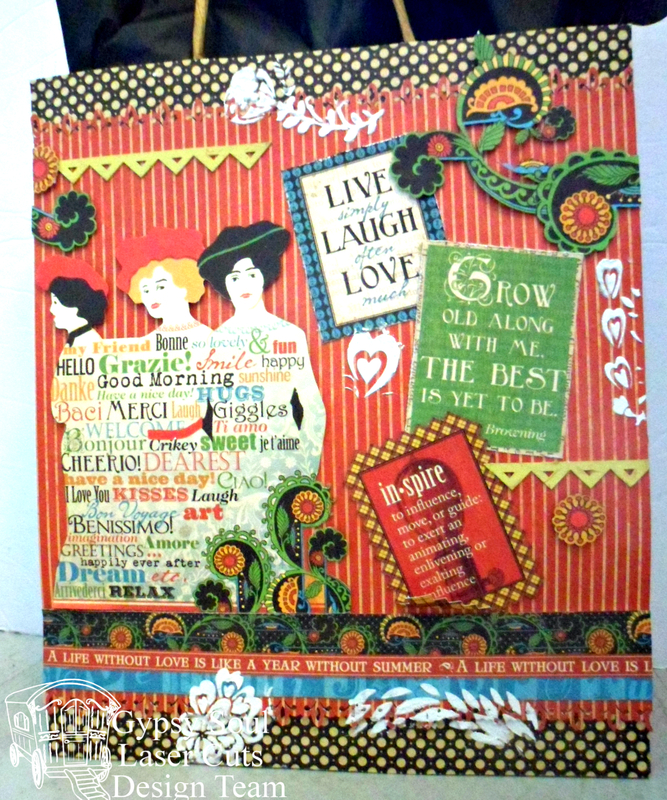 I had fun with this canvas, layering a variety of eclectic elements to create a hodgepodge of mixed media goodness. 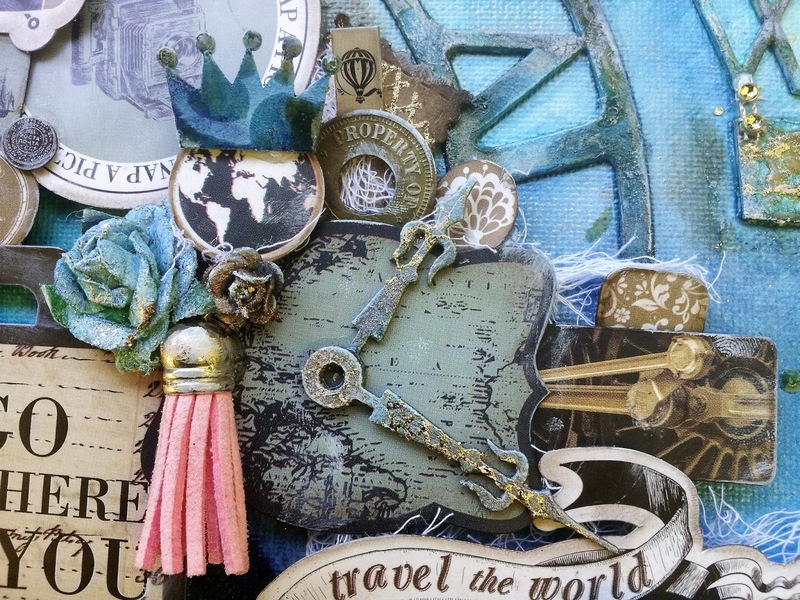 I used Skeleton Clocks and Steampunk Shape Set on my canvas. I fist painted a coat of white gesso over all the chipboard and then added color with sprays. I also tried rub-on foils over the painted chipboard and wooden pieces and it worked beautifully! Metal Number Plates to the mix. Thank you so much for visiting and allowing me to share my project today! 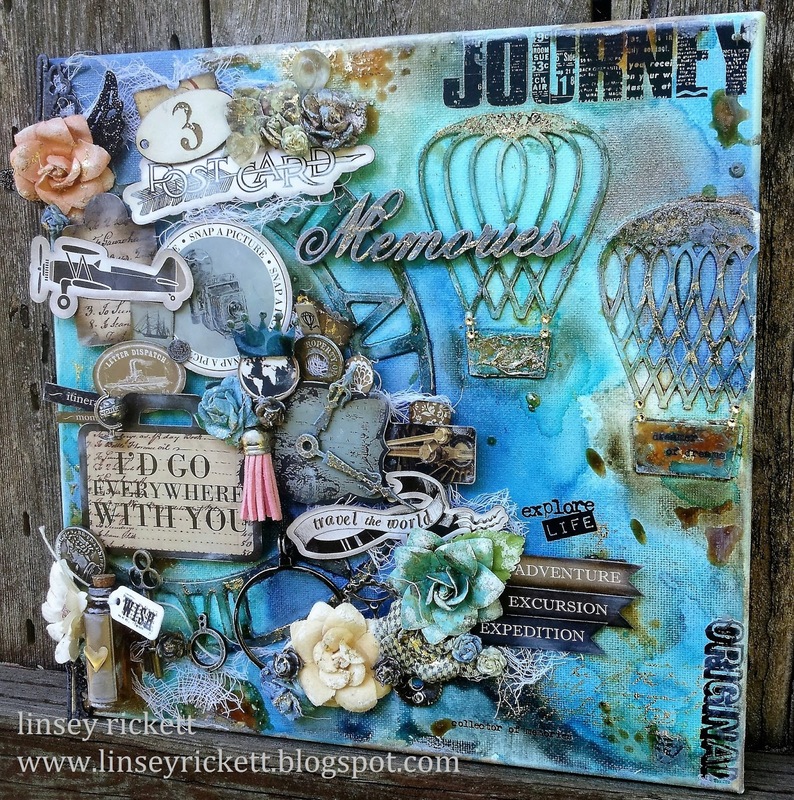 Wishing you a creative journey! Good morning! 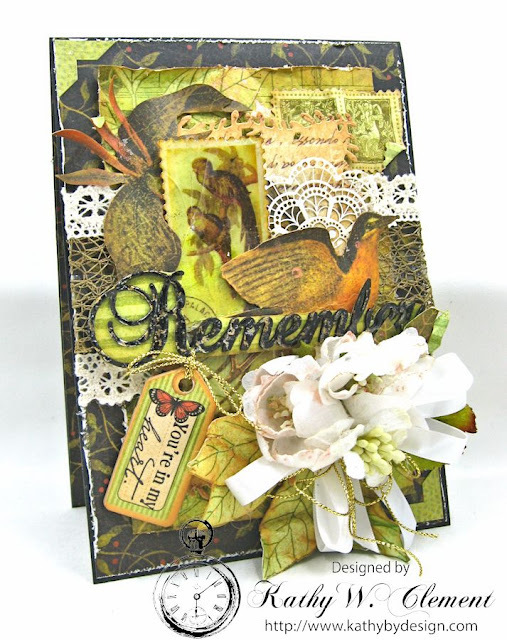 It's Gloria with you today, with Part 1 of a two-part project! The tutorial for today explains how to build a Mini Album Display Case, including adding feet and a handle. Come back on August 9th for Part 2 - Creating Four Mini Albums! The Mini Album Display Case kit comes with the display box (5 1/2" x 4 3/4" x 4 3/4"), the drawer (1 1/2" x 4 3/8" x 4 3/8"), and chipboard to make up to four mini albums (3 1/2" x 4 1/2" x 1"). 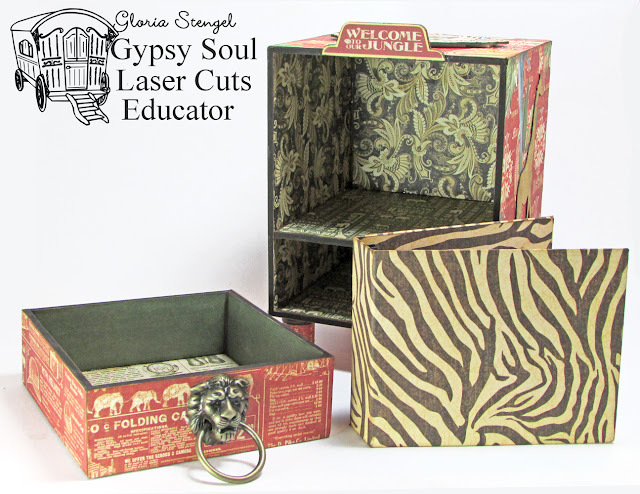 I used Graphic 45 Safari Adventures and Tropical Travelogue (retired) papers to decorate my display case. I added a very cool lion-head drawer pull (Graphic 45) to the drawer. I think that single, metal piece makes the whole project! Because the drawer pull was a bit "dangle-y" I needed to add feet to my display case. 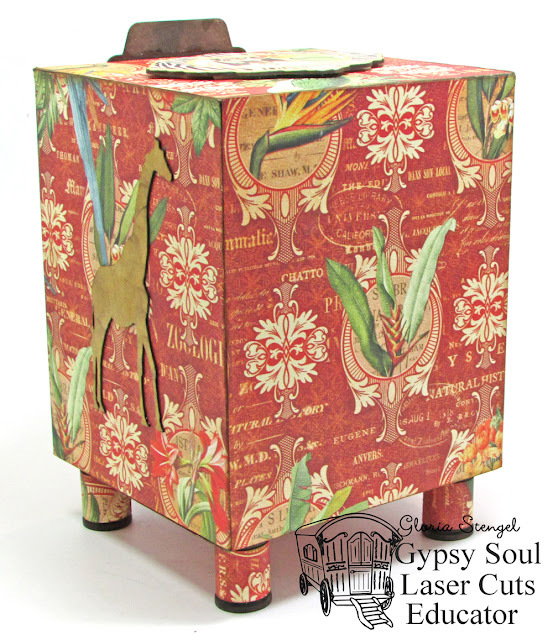 The metal feet in my stash could not allow for the drawer to be on the bottom of the case and still open, so, I got creative and made feet from some wooden spools! 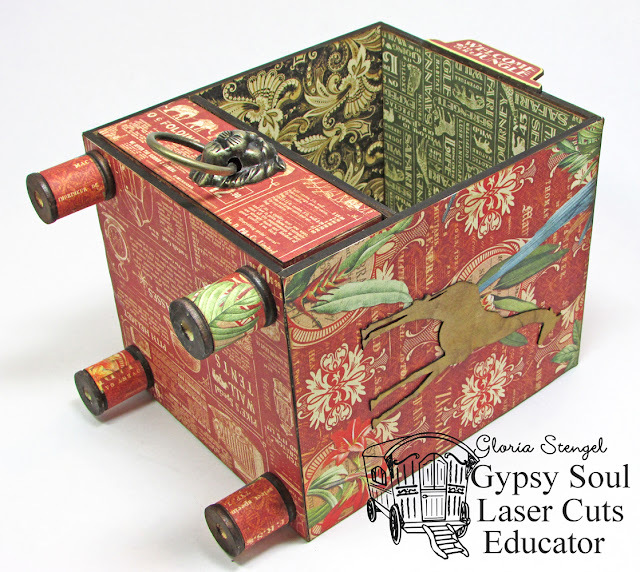 The box decor is very simple. I added the giraffe and the rhino from the Safari Shape Set to to the sides of the box. 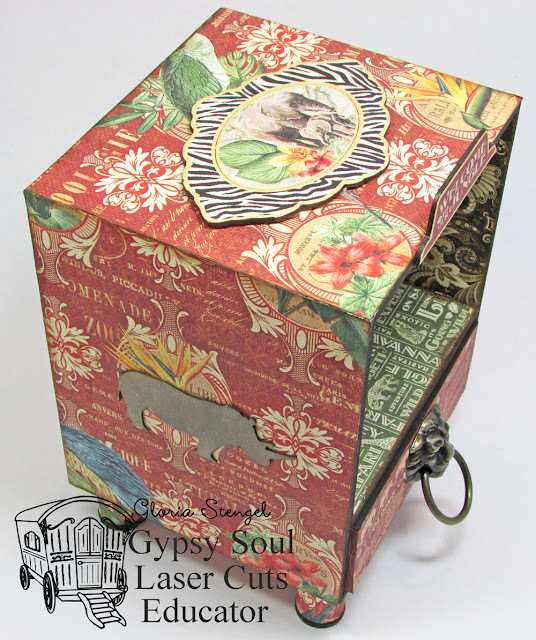 I also added some G45 printed chipboard to the top and front of the box. Here is a view of the back of the box. You can see those cute, matching feet! To see the Snapguide Tutorial for making this project, please click on the Guide below. Check out How to Make a Mini Album Display Case by Gloria Stengel on Snapguide. Come back on August 9th and I will share a tutorial on making the four mini albums for this box project. I have started one already, using some amazing zebra-print paper! Thanks for looking! Find all these wonderful chipboard items at the GSLCuts Store! 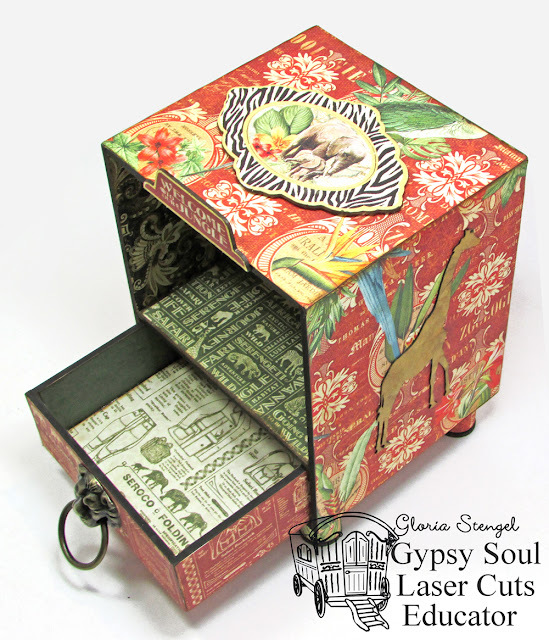 Hi and welcome to the Gypsy Soul Laser Cuts blog today. 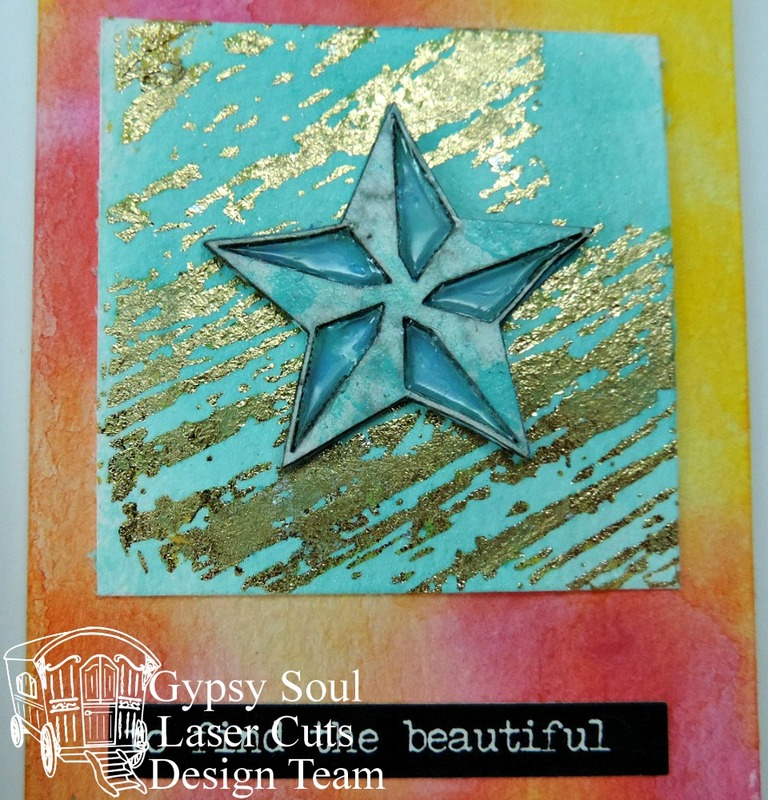 I get to be a guest designer again and thought i would share a quick card for all you cardmakers out there with the Medallion Star piece. I wanted it to be a quick card so my base is just layered pieces of some Ruby Rock-it Faded Empire scraps that i had leftover from another project i did. I chalked them all really good and glued them all down and then set to work on my chipboard medallion. And for that i had some fun with lots of inks in my stash. 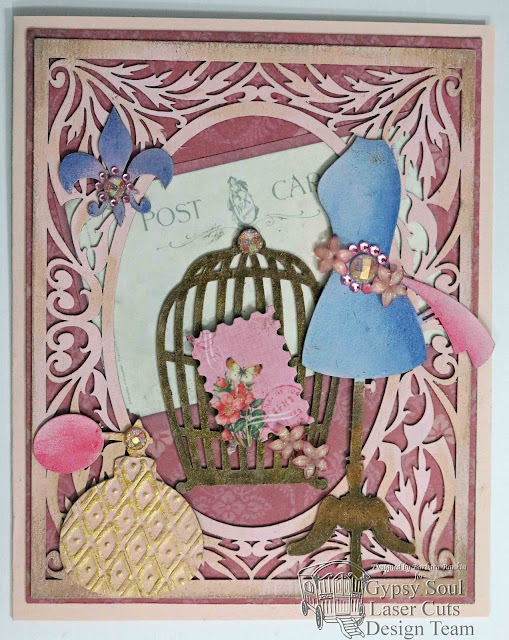 I pulled out lots of shades of pink to match the papers and then used each color to make the layers go from light to dark. 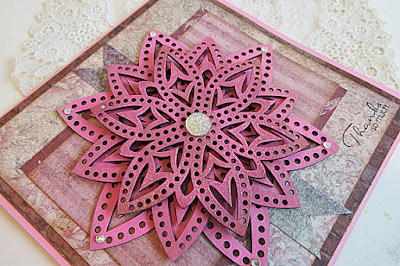 If you use white chalk on the chipboard first the next layer of pink will come out lighter since you created a light base for it. It was fun experimenting with it and when i got all the colors the way i wanted them i glued it together with 3D foam dots and adhesive and let it all dry. Then added the rhinestone in the middle and a few around the outside to make it sparkle more. 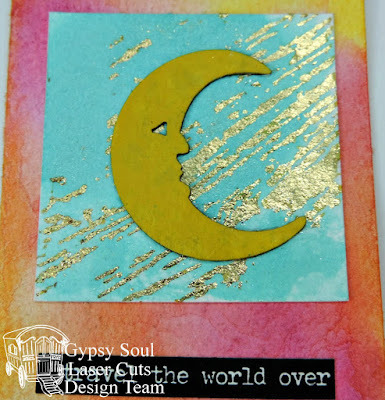 After i attached it to the center of the card i sprayed all of it with some pixie dust spray to make the whole thing sparkle and seal the ink on the chipboard. 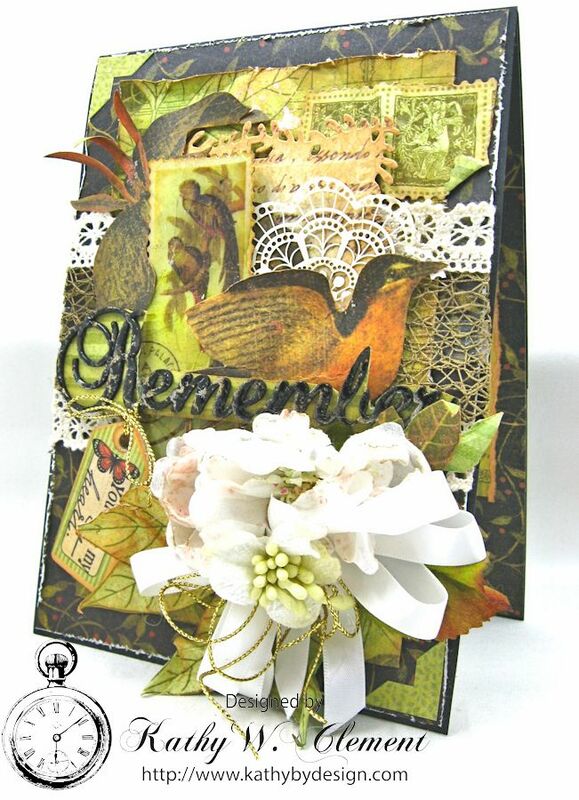 It's a really gorgeous piece of chipboard and i could think of a million other things to do with it too!! My next one is going to be a snowflake!! Once upon a time, on July 27 some years ago, an awesome thing happened....one of my favourite people in the whole world was born!! 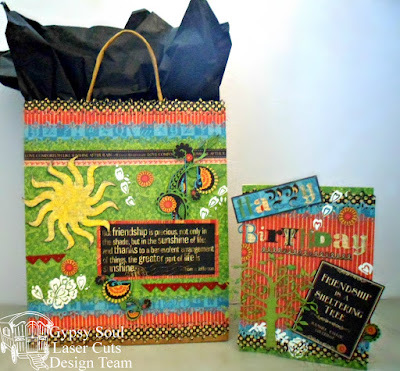 It's my best friend's birthday and I created this gift bag/card set for her using Graphic 45 Typography papers and some terrific Gypsy Soul Laser Cuts chipboard! 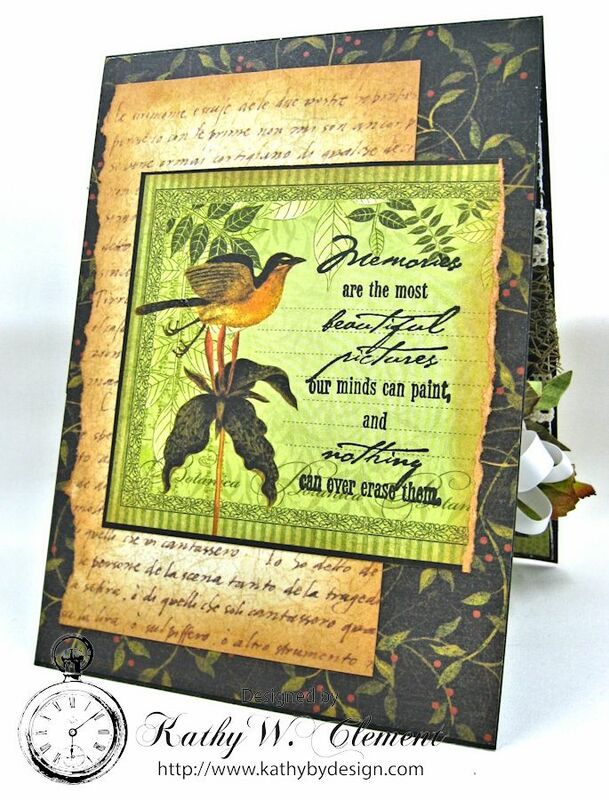 I love the friendship quotes that were on the paper cut-aparts and used several of those. 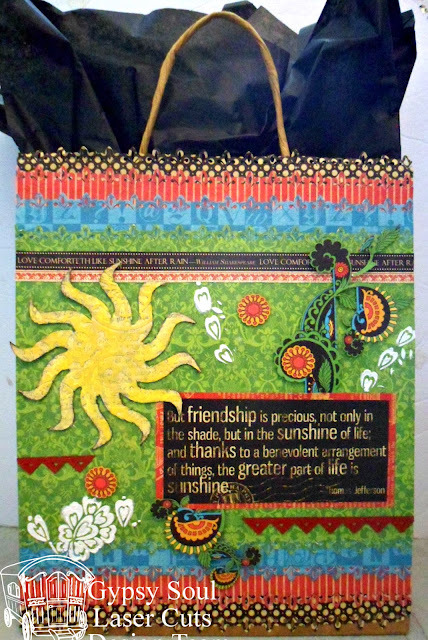 I often call my BFF "Sunshine" so I thought the sunshine quote and the chipboard sun were perfect for the front of the bag! 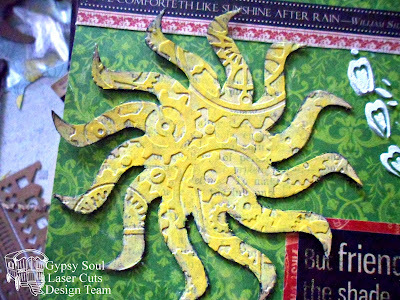 I covered the sun with patterned paper , dry embossed it , then misted it in yellow before adding light random brushstrokes of yellow acrylic paint and rubbing the raised parts with Ranger antique linen distress ink. 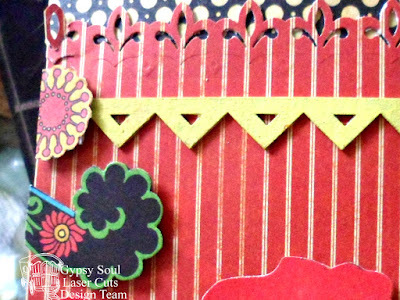 The red chipboard strips are from the Fiesta texture sheets. I have included a closeup taken of the yellow ones used on the back of the bag later in this post. 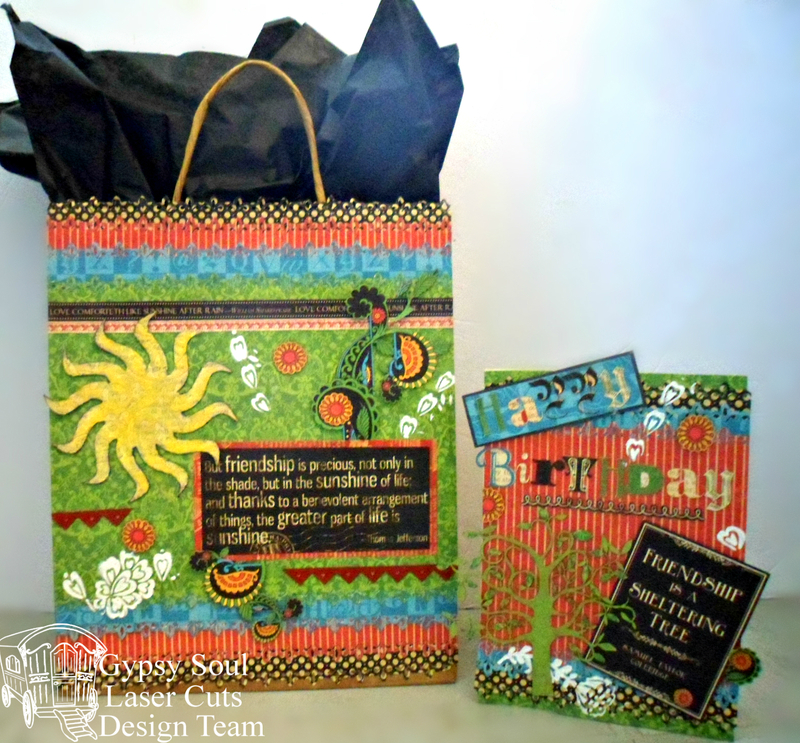 The back of the bag was embellished with strips from the Fiesta texture sheet painted yellow then rubbed with the same Ranger ink as the sun. 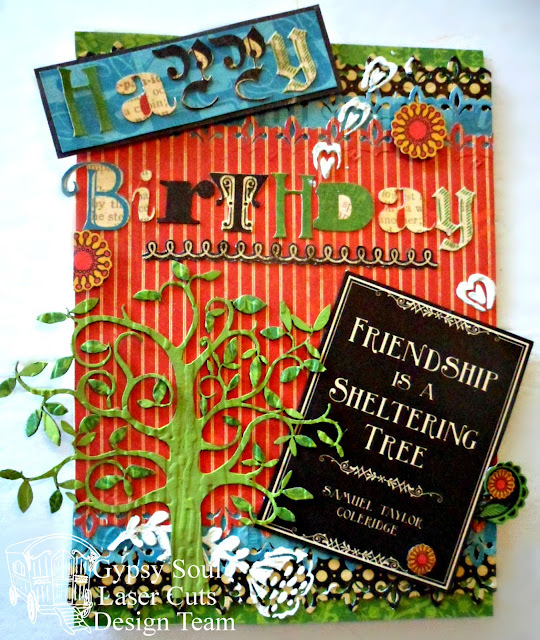 For the card I chose the "sheltering tree" quote and one of the Leafy Trees from the GSL store. 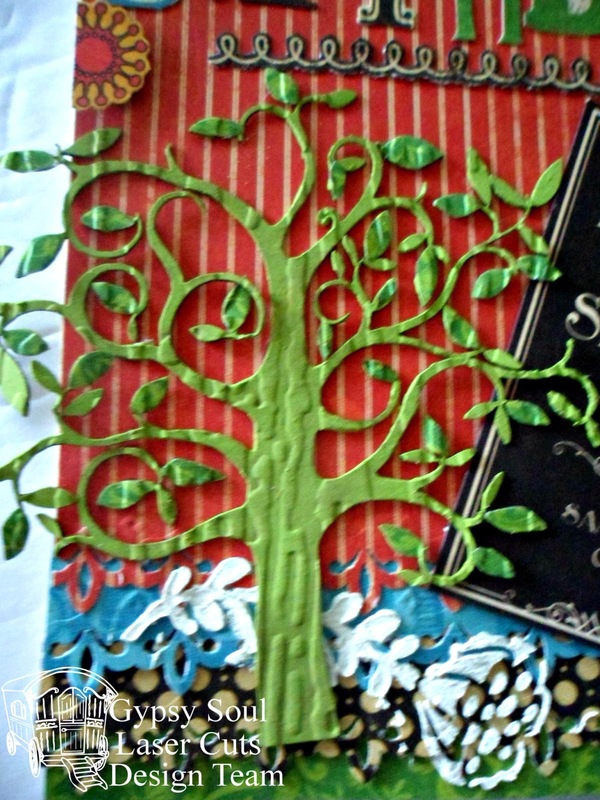 I painted the tree green, then cut leaves from the green patterned paper and covered random leaves with it then I dry embossed the whole tree with a wood-grain design. 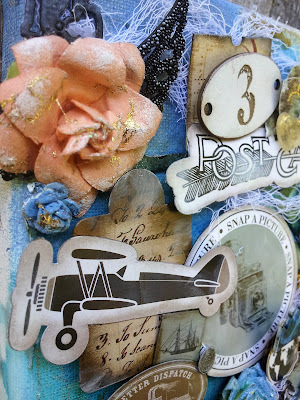 I popped up some of the pieces on my projects with foam tape for dimension and added a bit of stenciling with texture paste. The paper's colours and patterns are quite vibrant so other than a little layered punch work, I didn't think it needed a whole lot more detail. I sure hope she likes them. Thanks for stopping by and having a look. Wishing you a terrific week even if it isn't your birthday!